The Kinglets or Crests (Regulidae) consists of small bird species with beautifully colored orange or yellow crests that cover the crowns of the adults, hence the specie common name. They occur naturally in temperate North America, Europe and Asia, northernmost Africa, Macaronesia and the Himalayas. Two species exist in North America with largely overlapping distributions and two in Eurasia, which also share an extensive range. They generally prefer conifer forests, but will make use of a variety of habitats, especially when migrating. In Macaronesia, they are typically found in subtropical forests known as laurisilva or “laurel forest” and on uncultivated, open land with infertile, often sandy soil covered with rough grasses and small bushes or heather. Mediterranean evergreen shrub or small tree (Erica arborea) having fragrant white flowers grouped in large terminal panicles. It is the source of briarroot. Kinglets are just about the size of hummingbirds, measuring only 8 – 11 cm (3.2–4.3 in) in length (including the tail) and weighing 6–8 g (0.2–0.3 oz). The tail tip is notched. They have medium-length wings and tails, and small, needle-like beaks. The plumage is mostly grey-green with pale wingbars. 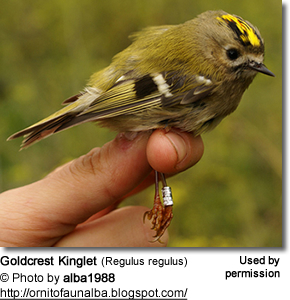 Most Kinglets have distinctive head markings, and the males possess colorful crown patches, which are duller and yellower in the females. The prominent feathers of the central crown patch are surrounded by black feathers; this center orange patch is erected during courtship and territorial displays. 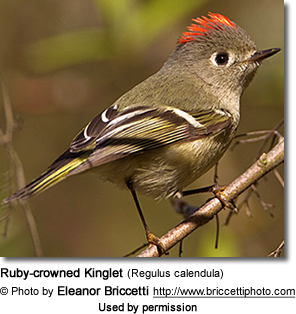 Five species have a single stiff feather covering the nostrils; except for the Ruby-crowned Kinglet, which has several short, stiff bristles. During territorial or courtship displays, the long feathers forming the central crown stripe can be erected, and these raised crests are very striking. In Eurasia, the Goldcrest Kinglet is expert at maneuvering about the conifer forests. 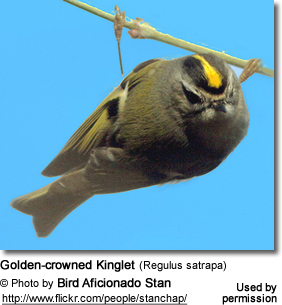 In North America, the Golden-crowned Kinglet is the most skilled. These species have developed special adaptations for moving about the conifer trees: deep grooves in the pads on their feet for perching on conifer twigs, and a long hind toe for gripping and moving vertically. The Ruby-crowned Kinglet and Common Firecrest spend more time seeking their prey in flight, so their feet are smoother and they have shorter hind toes and longer tails. ID: Olive-green upper plumage, buff-white lower plumage. Plain-colored face with conspicuous black eyes. The crown of the head has black sides and a narrow black front. Male has a bright yellow crest with an orange center; the female's is all yellow. ID: Bright olive-green upper plumage with bronze shoulder patches. Whitish lower plumage with brownish-grey on the chest and flanks. Black eye stripes with long white supercilium (line above each eye). The female has a bright yellow crest; the male's is mostly orange. 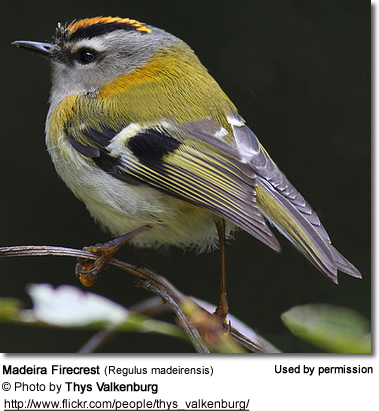 ID: A longer bill and legs than the Common Firecrest, a shorter white supercilium (line above each eye), more black on the wings and a deeper golden-bronze shoulder patch. The male's crest is duller orange. ID: The upper plumage is green, rump and flanks yellow, and the lower plumage is buff. There is a white wing bar on each wing. The crown has black stripes and a crest, orange-yellow in male and yellow in female. There is a white ring around each eye and a white supercilium (line above each eye). The throat and neck sides are grey. ID: Olive-grey upper plumage and white lower plumage. They have white wing bars, a black stripe through the eyes and a yellow crown surrounded by black. 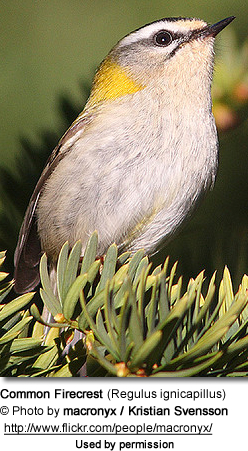 The adult male has an orange patch in the middle of the yellow crown. ID: The upper plumage is grey-green and the plumage below is olive-buff. The face is relatively plain. There are broken white eyerings around the eyes. The male has a scarlet-red crown patch, which is usually concealed by the surrounding feathers. The small cup nests are similar to those of several hummingbird species, they are made of moss and lichen held together with spiderwebs and these three-layered nests are lined with hair and feathers. Since the birds live in cold climates, they need to protect the nest and chicks; this method of nest building provides the necessary insulation. These nests are hung from twigs near the end of a high branch of a conifer. The entrance holes are covered with several feathers in order to conceal them from predators. The average clutch consists of 7 to 12 eggs, which are white or pale buff, some with fine dark brown spots. Because the nest is small, the eggs are layered. During incubation, the female will push her legs down among the eggs; her legs are warm due to the many blood vessels in them. The female alone incubates the eggs until hatching, which occurs about 15 to 17 days later. As space is tight, those chicks that have been fed will move down to the warmer part of the nest, while the unfed ones move up to be fed in turn. The chicks remain in the nest for about 19 - 24 days. 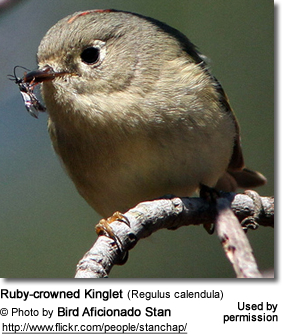 Kinglets mostly feed on insects, such as aphids and springtails with soft cuticles. They may catch insects in flight (on the wing) or they will fly to the ground to catch their prey. They also take insects and their eggs which are stuck to the leaves and other vegetation. Due to their tiny size and rapid metabolism, they must constantly forage in order to provide for their energy needs. If they are unable to feed, they may lose one third of their body weight in twenty minutes and may starve to death in an hour.